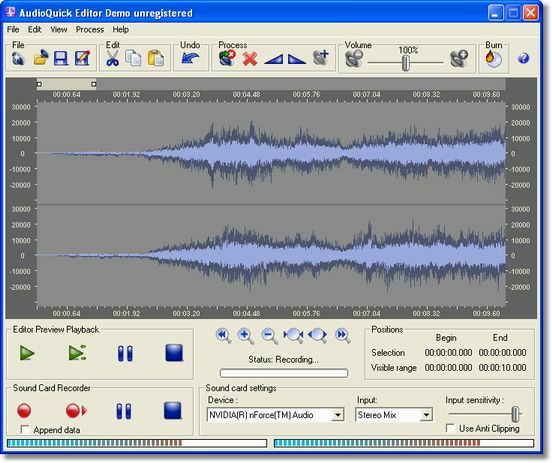 With AudioQuick Editor you can edit audio easily in seconds. Copy, paste, delete audio parts, apply fade in and fade out, crop audio, insert silence, adjust volume, even mix background audio at desired volume levels. Editor also can be used as convenient way to convert audio between 7 most common audio formats: MP3,WMA,AAC, MP4, WAV, OGG, FLAC. You can record all sounds coming from your sound card, and burn your own audio discs of edited music. ...... You can record audio when you play games, watch online video, movies, or listen to music even if it is protected. You can also unprotect any kind of protected music by recording it from sound card, digitize analog LP records and tapes, record voice from microphone, or other source such as MIDI, VCR, Internet audio streaming, Skype calls or other VoIP calls, Quick Time, Real Player, Flash, iTunes and other software. After this, you have possibility to immediately edit and fine tune recordings in previously described ways, and save the result to desired audio format. With inbuilt discs burning software you can also write your own audio CDs, data CDs and DVDs, write data to images and burn discs from them. Simple-to-use tag editor with UNICODE support, playlist and filelist generator. Infix - The PDF Editor. Edit PDF Files the easy way. Qweas is providing links to AudioQuick Editor 1.2 as a courtesy, and makes no representations regarding AudioQuick Editor or any other applications or any information related thereto. Any questions, complaints or claims regarding this application AudioQuick Editor 1.2 must be directed to the appropriate software vendor. You may click the publisher link of AudioQuick Editor on the top of this page to get more details about the vendor.